So, I rewatched the “Netflix Original” documentary set “Cooked” again. Based on the book by Michael Pollan, it also features and is narrated by him. One chapter in particular, “Air” is what got me on the road for making my own bread. So, I tried several times to make bread using an “air start” sourdough core. In every case, what I got was a flavourful but remarkably dense bread. It was edible, but it just wasn’t matching what I thought bread should be. 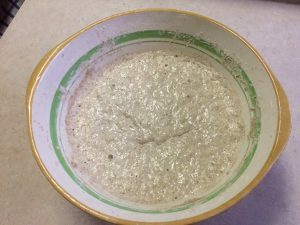 Commercial yeasts did what I expected, but it was missing the depth of flavour and aroma that my sourdough experiments yielded. So, about a week ago, I went back and rewatched “Air”. I figured out what it was I was missing. Bread, at its most basic, is water, flour, salt and yeast. Everything after that is just artifice, or gilding the lily. However, sourdough needs one much more ethereal ingredient; time. The French-Canadian bread maker in “Air” lets his mixtures between twelve and thirty-six hours, depending what he’s going for. Michael Pollan aims for eight to twelve hours, based on regular progress taste-tests. So, a week ago I restarted the journey for a good sourdough loaf. A “permie” friend of mine gave me a cup of her own sourdough core as a start point and over the interval I’ve been “feeding” it a whole-wheat and water diet, three or four times a day to build up to a one litre mixture. It’s a busy culture, and uncovering it each morning for the daily skim-off and then feed-up smells marvellous. I mixed the whole thing thoroughly in a big ceramic mixing bowl, covered it with a tea-towel and went to go play a video game. Some things to note; the surface is covered in bubbles. This is happily fermenting away, which is exactly what we want. You’ll see that it’s a bit wet, and that’s good as well. You need that dampness to keep the process running. The green line is about ¾ the height of the bowl. When the mixture went into the bowl last night, the surface was around ⅓ the depth of the bowl. The bowl itself slopes outward pretty sharply, so this has nearly tripled in volume over night. That’s a huge rise compared to what I got before. 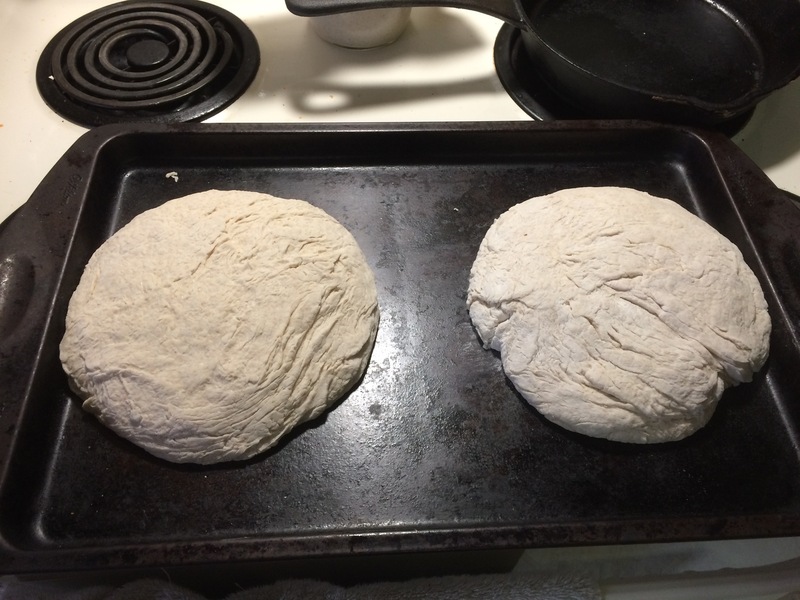 … and now they are going through a second rise. In about an hour, I’ll be turning the oven on and I’ll report back what I got out of this exercise. My fingers are crossed!